Read Edith Sherringham's account of Life in Caston around the turn of the 20th century. This account is based on a tape recording made for the 1974 celebration held in Caston for the 600th anniversary of the completion of the parish church. In this account Edith remembers back as far as 1905 and recalls WW1 troop training at Flaxford House. My parents bought Flaxmoor about April 1905, just after returning from India. I was then seven and my sister Rachel was four. She still thinks of Flaxmoor as her “home” and counts her days there as the happiest time of her life. Between 1897 and those Flaxmoor days my father, a retired Colonel of the Cheshire Regiment, spent most of his time taking packs of foxhounds to India via the old Anchor Line. In India, we had an ayah (a children’s nurse) and later a twelve-year-old Indian houseboy named “Shewah” who taught our baby donkey Lena to go in harness (of broom handles and string) to pull us to Poona races with Rachel as back seat passenger. Father shot panthers with his homemade bullets and Shewah showed me scorpions. Soon after coming to Caston, we had five wild Exmoor ponies come by cattle truck to Stow Bedon station from Bampton Fair, Devon. They pulled the large lawnmower and a small cart in which we were taken to local private schools. In June 1911, our parents lost their entire savings in the collapse of the Charing Cross Bank, and later that year Flaxmoor was let furnished. We went by Anchor Line ship to New York and thence by train to relatives in Virginia, returning in 1913 when we went to boarding school in Kings Lynn. While at Caston we took part in plays at the village school. We made pop-guns (to fire acorns) and played games such as croquet, tennis, rounders, French and English, and we played with hoops. Rachel’s early memories are of pony riding, of going to parties in Mr Alfred Banham’s carriage known as “The Pill Box”, of skating at Scoulton Mere and on the flooded meadows behind what is now The Old Rectory and of going to a meet of the West Norfolk Foxhounds at Scoulton. Rachel left school in 1916 and worked on the nine acres of Flaxmoor garden; she also cared for our cow “Aunt Alice”, named after my favourite aunt in Virginia. I also left school that year and worked first as wartime groom in Norfolk and then as a land worker in Gloucestershire before joining the W.R.A.F. in 1917 as a driver. After demobilisation I had the first motorcycle in Caston and drove a Watton doctor in his Ford car. 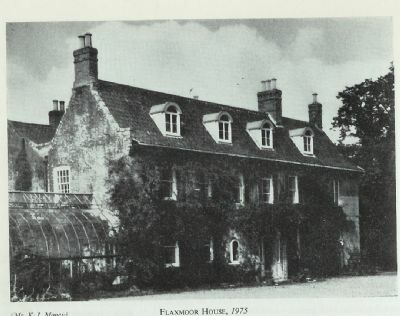 Flaxmoor is a large house whose rooms then included “The Boudoir” (which had arums painted on the door), “The School Room”, where we learnt to write, “The Butler’s Attic” and “The Justice Room”. The kitchen had an old “Eagle” range with several hotplates and dampers and a burnished steel fender. It heated the bath water and consumed nearly one hundredweight of coal each day, so baths were few and we had to saw wood to save expense. Once a year father bought a truckload of coal direct from Wales for about £11. It was carted home from Stow Bedon station in tumbrels drawn by carthorses from Church Farm. Next to the kitchen back door was a cobbled porch to the larder within which was a small dairy where we skimmed our cow’s milk to make butter in a glass churn. A well beneath the scullery provided beautifully pure and sparkling water. From a rainwater well, Tillett the gardener pumped up water to the upstairs cistern twice a day. Stephen Tillett was a first-class gardener, often stoking the greenhouse fires at midnight in frosty weather for the peaches and grapes. In summer, one of us rode the smallest pony to pull the mowing machine whilst Tillett worked the mower. He sang songs to the pony – “Whoa mare, you’ve earnt yo’ lil’ bit of corn”. Of his children, ‘Gal Ada’ was my age and taught me how to cure warts. His wife was from London. The kitchen garden had many varieties of apples, pears, plums and soft fruits, a peach house with nectarines and apricots, and a vinery. We drove the pony to Stow Bedon station with garden produce for the Army and Navy stores in London, bringing back the Eastern Daily Press newspaper. Prior to the war father had collected pigs, rabbits, poultry, pigeons, dove, Indian monawl pheasants (whose eggs sold for £5 each), a cow and two ride-and-drive 14.2 ponies. There was a good stable, a harness room and a coach house with two stalls and four loose boxes. He had to employ a groom, a boy and a gardener. The house often had ten temporary residents, mostly relatives on leave or on holiday, and we had several indoor staff – a cook, a house parlour maid, a tweeny or between maid, usually a fifteen year old girl learning housework under my mother, and sometimes a houseboy (at one time Albert Cator) to clean boots and knives and to help in the kitchen. Mrs Tillett helped if necessary – at one Christmas, there were eighteen of us. We helped with the housework and chopped and sawed wood, while father provided food by shooting rabbits, hares, pigeon, snipe, pheasants, partridges, blackbirds and woodcock. We also ate our domestic hens. After having his leg amputated in 1921, father shot game from his revolving office chair placed on a donkey cart. He also rode his wife’s Mayhew sidesaddle. (Mayhew was a well know London saddle maker famous for sidesaddles). In his gunroom was a large case of birds he had shot in India. They were covered in Keating’s powder to keep out moths. From India father’s eldest son sent him a Tonga, a two wheeled Indian cart with a centre draw pole for two ponies and a removable canvas hood. It came in crates and was assembled by Mr Alfred Banham at The Green and had a complicated harness. Ernest Knights became father’s great stand-by and drove the Tonga all over Norfolk on military duties for the Norfolk Volunteer Regiment. Father often went to Holkham to see Lord Leicester, Lord Lieutenant of Norfolk. to Caston Post Office, and of the graves of a previous owner’s dogs in our shrubbery, as the spinney along Green Lane (now Stow Bedon Road) was called. Father died in November 1923 in the Gun Room and was buried in Caston Churchyard. Flaxmoor was sold and we moved to Rustington, Sussex, to another Flaxmoor, thus ending a way of life.